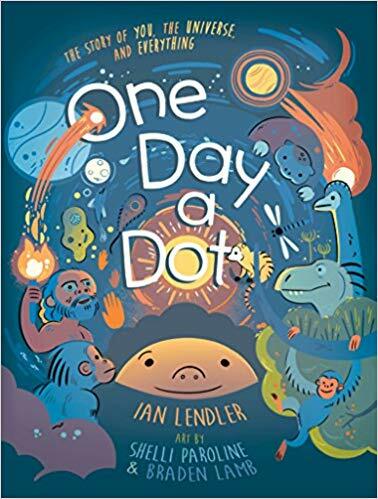 It's not every day you come across a picture book that seeks to explain the Big Bang theory and evolution to the very youngest of readers. 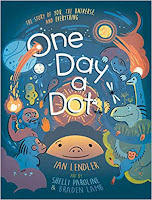 Yet, I'd say Ian Lendler, with the assistance of illustrators Shelli Paroline and Braden Lamb have definitely pulled it off in a way that is fun and easy to understand in One Day a Dot. Of course, to simplify billions of years of history in such a way undersells how long these things actually took and also implies that the time between events was equal, but as an intro it's fine. The only small change I'd personally make is the section on the meteor that wiped out the dinosaurs. They make it seem like the only land animals that survived were mammals when that's not true. Perhaps Neil deGrasse Tyson would have other critiques, but mine are minor and overall, I'd recommend it.